At the risk of stating the obvious — in most restorative situations, the more a tooth can be left untouched, the greater residual strength it retains, and hence, the better its prognosis. This is sometimes difficult to accept since the traditional undergrad teaching I recall was that the solution to most problems in restorative dentistry begins with a sharp new bur and a well-oiled, fast handpiece. The tide may be turning, however, since minimally invasive dentistry seems to be the “buzz” area of dentistry in recent years. A position paper in the British Dental Journal (May 2015) by the restorative dental societies read as a cautionary tale regarding the perils of poorly planned, poorly executed restorative dentistry. The piece highlighted for me how over-enthusiastic removal of tooth structure from around the outer aspect of a tooth (e.g., during crown preparation) can weaken the tooth and compromise pulp vitality. Subsequent overzealous removal of tooth structure from around the inner aspect of a tooth (during pulp removal) can further weaken the tooth, jeopardizing tooth survival. Dentsply has addressed the idea of minimally invasive dentistry as it pertains to endodontics with the new WaveOne Gold file and range of accessory products. The distinctive color difference is the first thing you’ll notice about the new WaveOne Gold file — a result of proprietary heat treatment after file manufacture — but the revision of design goes a lot deeper than color alone. The file range has been expanded to four with the inclusion of the medium (green) file. This improvement allows for a greater number of teeth to be prepared using a single file; previously, there would be a few cases where I might have felt the canal was too large for the primary file, and selected the large only to discover this instrument was too big to take to length. I then ended up opening the primary file after all! With the increased choice of file sizes and a more gradual increment of size increase between them (with the large file now slightly larger), the clinician is better able to select the right file first time. An improved nickel-titanium alloy means WaveOne Gold files are 80% more flexible compared to their predecessors, resulting in files with reduced tendency for removing excess dentin through the straightening of curved canals. The taper of WaveOne Gold files reduces from the tip along their length. This gives rise to canal preparations, which are more slender compared to their predecessors. Such preparations are more conservative of root dentin, which is the feature of the new file system that I like the most and proved most crucial in the following case report. There is good evidence that canal preparation up to at least a tip size of 25 is essential for irrigant delivery to the canal apex and effective irrigant exchange in that portion of the canal. I love that these new files simultaneously permit the adequate opening of the canal for effective cleaning, while conserving maximal dentin at orifice level. Hopefully, in the following case, it may be appreciated how the final shape of the prepared canal is more conservative — minimally invasive endodontics indeed! This previously crowned upper left lateral incisor was referred for root canal treatment with no clear canal visible radiographically (Figure 1). The referring dentist had removed the old crown to assess restorability, which he/she felt was touch-and-go after cleaning up the preparation (Figures 2 and 3). During my patient consultation, we discussed the idea that surgical crown lengthening would probably not be a suitable way to gain more supragingival tooth structure. The gingival margin profile of UL2 was already more apically positioned than the UR2; we agreed that moving it farther apically would create a disharmonious unappealing asymmetrical smile-line (Figure 4). Instead, I selected the new WaveOne Gold primary file to rescue the case, preserving as it does the maximal amount of dentin. After anesthetizing and isolating the tooth, I scouted for the canal opening with magnification and illumination, careful not to overly weaken the tooth through poor access angulation or an excessively wide cavity. Once I had found some clues as to canal location (Figure 5), I flared the canal and established the glide path with the ProGlider® file. After irrigating, I confirmed working length before tapering the canal with the WaveOne Gold primary file (Figure 6). 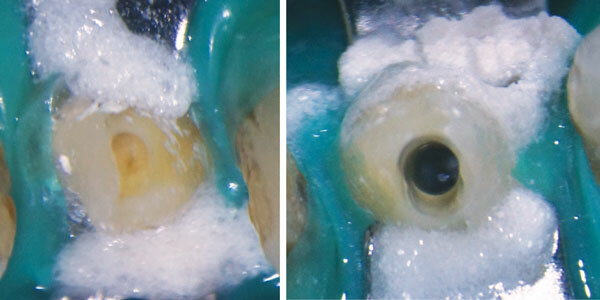 I completed the case with warm vertical compaction of gutta-percha cones coated in canal sealer (Figure 7). The WaveOne Gold files represent a leap forward for canal preparation. They make mechanical preparation of even curved canals safer, quicker, and easier than the already impressive files they supersede. The time saved can be dedicated to irrigation, which can only help success rates for the specialist and general practitioner alike, and I wholeheartedly recommend them. Dr. Peter Raftery is the specialist at Hampshire Endodontics in Havant, Hampshire, United Kingdom. You can contact him at hantsendo.co.uk. Disclosure: Dr. Raftery has no official links to the products mentioned in this article.